Rocky slot is one of MGM slot series that are inspired by movies from the production powerhouse. The game highly borrows from the movie and has flawless incorporated majority if the core elements and characters from the movie Rocky. The results are high performance and top quality online slot. Rocky slot is an example of a well-made slot game. Everything appears to be where it is supposed to be. The slot game has a striking design with a faultless presentation. The high-quality graphics and animations are all that a slot lover can ask for. The sound is surround and features sound bytes from the movie’s soundtrack. The 3D sound is used creatively to enhance the user experience during gameplay. For example, the reels spin in an exciting rhythm that will leave your ear drums dancing in excitement. The characters of the movie are seamlessly incorporated in the slot with each character having an extraordinary move for a winning combination or a quick one-liner. The pictures in use are that of Rocky, Sylvester Stallone, and of course his opponents in the ring Master of Disaster (Apollo Creed), Siberian Bull (Ivan Drago), the Southside Slugger (Clubber Lang), Adrianno (Rocky’s wife), and his brother Paulie. Since the movie is a boxing movie, we have a red and blue corner set of gloves being used as part of the imagery in the slot game. As a sign of homage, the letters R, O, C, K, and Y appear coined from the American flag. The gloves and letters appear as special bonus symbols. The Rocky Slot game is fun and pleasurable to play since it boasts of exciting features. The Game not only provides great entertainment and a memorable gaming experience, but it also rewards generously. You will rarely go without winning something or activating special bonus features. Rocky slots are a five-reel and 25-pay lines game. The game gives players a wide betting range with coin denominations ranging from 0.01 to 5.00 and up to 10 coins per line. This means that if you use a single coin and 0.01 credits per line, your total bet will be 0.25 per spin up to a max of 2.50 a spin. On the other hand if wage 5.00 at a single coin per line, your minimum bet is 125 and a max bet of 1250 per spin. The Rocky Feature makes use of the letters spelling the name ROCKY. To activate the feature, players need to spell “Rocky” on the reels from left to right. If players are successful in landing the letter combination, all the letters turn to solid gold one after the other until the name “Rocky” is written I blazing gold colors. This feature rewards 5x you total bet. The scatter symbol in this slot activates the free games bonus round. The Rocky logo plays scatter, and you will need to at least land three of them to trigger the bonus round. If you manage to pull 3,4 or 5 of the Rocky logos anywhere on the reels, you get rewarded 15, 20, and 25 free spins respectively. All come with a 20x multiplier. The bonus round has generous payouts owing to the extra wilds. The free spins can appear continuously in bundles of fifteen if you manage to land more scatters. 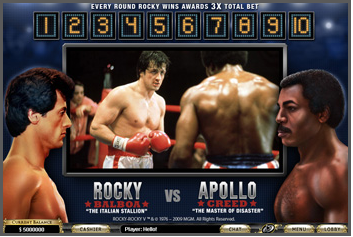 To crown this feature, when you spell Rocky in the free bonus round, you get your bet total multiplied by ten. The two rarest symbols in this game are the boxing gloves. This is so because the white glove only appears in the first reel, and the red glove is restricted to the fifth reel. Both gloves must appear on the reels to trigger the knockout round. The player gets to choose their opponent who will fight him for 10 rounds. For every round won, the player gets a 3x multiplier, if the player is knocked out before the final round; the player is rewarded for all consecutive rounds up to a maximum of 30x. The Gamble feature adds excitement to the game and gives players a chance to win more, 5,000 credits maximum. The Gamble round lets players predict the color of a card. A right prediction doubles the winnings up to 5,000 credits. However, a wrong guess ends the round and the player loses all his winnings!